It has been over 30 years now Australian multihull builder, Seawind Catamarans, has been supplying the world with its range of personal and charter designs. You would think they have the process nailed pretty well by now. If anyone still held lingering doubts they only need to check out the latest 40 footer: the Seawind 1260. A long-serving boat building team at its Vietnam production facility knows how to build strong yachts while increasingly upgrading quality and adding features to each new model they produce. Seawind tend to break the European mould, they did it from its very first model. Noting the excellent weather Australians enjoy, Seawind designed cats opened up the interior saloon to the aft deck like no other. Most Euro models also strive for a large interior volume to entice the sailing family and charter market. While Seawind also rely on charter sales it designed a lower freeboard to retain a sleeker look to the eye. This may reduce the interior volume in comparison but catamarans are such voluminous craft nowadays, due to better boatbuilding techniques, that it hardly detracts the aspiring yacht buyer. Less volume in the two hulls may also be noted by potential buyers, but the advantage the sleeker hull shape provides is in performance. Catamaran designs increasingly take advantage of multihull’s speed differential compared to monohulls. By sacrificing a little speed, designers can increase the volume and weight of the yacht to make it more liveable and enticing. It would appear Seawind have just dialled that back a touch to maintain a good pointing and speed ability upwind, a well-known problem for multihulls. It also means the Seawind 1260 can be less boxy as other designs, getting into thinner marina berths and making it easier to handle at sea. Thankfully, while keeping the profile low to the water, Seawind designers have not sacrificed bridge deck clearance, the other well-known problem in multihull design. At 76 centimetres high this is a suitable distance to reduce annoying wave slap under the hulls. As part of its design philosophy, Seawind want its catamarans to cross oceans and all of these design principles assist in that aim. Plus, with intimate knowledge of its primary Australian market, thought was put into where they are most likely to be sailed. The interior, therefore, is optimised for warm weather cruising. The iconic Seawind fold-up doors make the interior and back deck seamless and, along with the opening front cabin windows, ensure plenty of good airflow moves throughout the hulls. The hulls are open to the main cabin to ensure that airflow reaches down below. It is only the cabins and heads that have privacy doors. Seawind realised early on that the back deck area does not require removable covering. With such a large deck area, if you want to lounge in the sun there is plenty of deck space to do so. To that end the cabin roof continues aft across the back deck to further strengthen the link between inside and out. This cabin roof holds the tri-fold cabin doors well out of the way. up barbecue and on the starboard side is a sink and bench for cleaning up. Both areas are in dedicated lockers with lockable covers. A neat trick. There are several advantages of making the interior and back deck into one flat area. Firstly, it makes such a huge space that the steering stations do not have to be raised, thus allowing the skipper to be part of the conversation down below. Once you keep the steering stations below cabin roof height then you can also keep the boom low down and reduce the air draft height of the mast while maintaining a good sail area balance. The port side holds the main steering station with the twin engine controls. There is a chartplotter on a swing arm inside the bulkhead window, this means the skipper can easily reach in and swivel the screen to view, or it can then be swivelled back inside for easy viewing by the navigator. Full 360 degree vision from both stations is achieved through the large windows forward. Both steering stations have a large fixed viewing window to provide good vision up the mast. You can either sit undercover on the provided seats or sit outboard on the side deck in the sun and still reach the wheel easily. The steering is independently run to allow redundancy in case of failure. The seat backs can be reversed to allow someone to enjoy the wake as it disappears out the stern. The seats can house the movable chiller storage seating. The navigation station is on the port side of the main cabin lounge. The cabin lounge would easily sit six to seven. Its table may also drop to make a massive double bed if wanted. The port hull contains the master cabin taking up the entire hull. The head and separate shower cabin is aft and the master bed runs laterally from the bridgedeck up forward. In the centre section there is plenty of storage. In the aft section is access to the engine room, which includes fuel tanks and the steering cables. The twin Yanmar 22 kilowatt (29 horsepower) engines push the hull easily with a total of 440 litres of fuel to get you there and back. In the starboard hull the forward berth runs fore and aft over the bridgedeck allowing the aft cabin users access to the forward head and shower. Again there is plenty of storage on the walls, under the beds and in the forepeak. Both head/shower cabins have good elbow room which is sometimes difficult to achieve in a catamaran, especially when it is in the forepeak. The galley sits in the middle of the starboard hull and has easy access to the main saloon. There is plenty of storage and bench space in this inline galley concept. While you can wedge yourself easily in the walkway, there really is no need to in a catamaran. The refrigerator/freezer is huge, a whopping 130 litres. You add that to your chilly bins outside and there is plenty here to feed the hordes who always visit at sundowners. The stove top is a three burner, which has always seemed more sensible to me than a two, or even four, burner. The bench top is a strong melamine called Polystone. As mentioned, plenty of light filters down into these centre hull sections, in the cabins, berth and heads, there is also plenty of hatches and hull portholes for more light and air when privacy dictates. Overall, the build is strong and simple; while it cuts out many frivolities in construction, the modular concept is smooth and nicely rounded. The large open main deck space consists mostly of comfortable seating with little in the way of cabinetry. There is still plenty of storage space, but it is preferably centred low in the hulls to assist in reducing pitching, rocking and rolling. On deck is a standard layout: anchor wells and life raft storage on the centreline between trampolines up forward; bow seats in the pushpits; good oversized rigging and deck-stepped mast section with all lines running aft to both steering stations; mainsail traveller on top of the aft deck roof with controls leading down to the port side steering station. Once again Sydney Harbour did its best to make sure we could not get up to cruising speed on the day of testing. But Huey’s bad mood did not stop the 1260 from showing its capabilities. With only ten knot of breeze we still managed to slip along at 6.5kn while maintaining just over 30 degrees of apparent wind angle. Quite remarkable, which translates into a lot of money saved from not needing the engines so often. 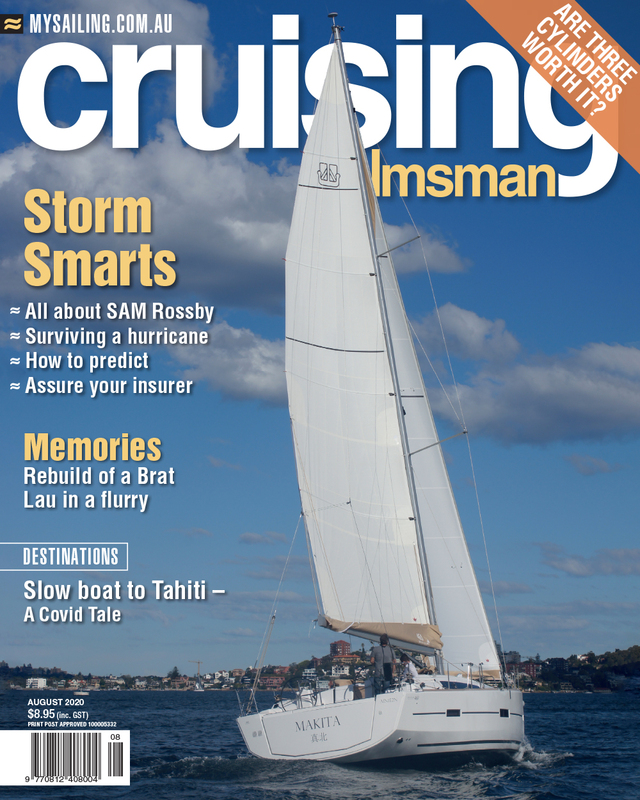 Seawind clearly also understand that to cruise in Australia you sometimes have to travel a fair distance. Tacking through the wind at this TWA angle was not a struggle either. It appears on the specifications that the Seawind has quite a high aspect ratio rig. With the steering stations down at deck level the boom is quite low but also long, extending out past the transom. The fully-battened mainsail with its high roach delivers plenty of power. We only used the small self-tacking jib for ease when single-handed. But, combined, this provided more than enough power to get up to a respectable speed in under ten knots. Specifications imply the Seawind 1260 would easily maintain at least 10kn day runs with ease, when the steady nor-easters blow. Who could ask for more than that from a twelve metre yacht?